Harold William Phillips was born September 8,1920, in Smithfield, Utah to George W. Phillips and Alice Dora Lyon Phillips. He was the fourth of five children. He passed peacefully from this life to the next on August 17, 2017 in Montpelier Idaho where he resided since 1949. He attended school in Smithfield. While attending school he also worked at weeding and topping beets, shocking grain, hauling hay, working at the pea vinery, building frames and caring for beehives, and delivering handbills for the grocery store. He attended high school and played basketball for North Cache High School, lettering two years. He met his wife Roma Stauffer in the summer of 1938. They were married on September 25, 1940 in the Logan LDS Temple. 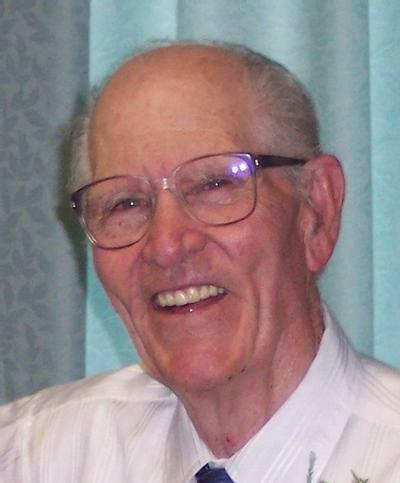 He graduated from Utah State University in 1942 with a degree in Biological Science. In January of 1943, he was inducted into the Army and ultimately trained as a medic. He entered the war in Germany from France with Patton’s 3rd Army in January of 1945. They moved across Germany rapidly through Frankfurt, Mulhausen, Erfurt, Regensburg, Passau, and into Czechoslovakia, and then to Linz, Austria. While in the area of Erfurt, Germany, he assisted in the liberation of a concentration camp at Ohrdurf and treated the survivors. This was the first camp liberated by the allies. The war ended while he was in Linz, Austria, and in January of 1946, he was discharged. In the fall of 1946 he returned to USU for graduate studies. In 1947 he started teaching at Altamont High School in Altamont, Utah. His salary for the year for teaching and coaching was $2640. With no doctors in Altamont he was often called upon to put his experience as a medic in the Army to good use. In May of 1949 he agreed to teach biology and chemistry at Montpelier High School. In 1955, after having completed a Master’s Degree in Administration he accepted the principal’s position at Montpelier High School. During the summer of 1965 he taught summer classes at the University of Arizona in Tucson. Approximately 2,634 students graduated from Montpelier High School while he was principal, many of whom excelled in their chosen fields throughout the world. He retired as principal on July 1, 1980. He and A.J. Winters, who preceded him as principal, were the High School principals continuously for over 55 years. He was preceded in death by his parents, two sisters and two brothers. He is survived by his wife of 77 years, Roma Stauffer Phillips, three children, H. Nolan (Bonnie) Phillips, Aralee (Roger) Sparks, and Elizabeth “Liz” (Don) Lowe. He has 10 grandchildren and 37 great grandchildren and one great great granddaughter. Always an active Member of the LDS Church, he has had 12 descendants serve full time missions, 2 serve as Stake Presidents and 8 as Bishops or Bishopric members. Fourteen descendants are Eagle Scouts. All his children and grandchildren have sought higher education with four having received doctorate degrees and several with master and bachelor degrees following his admonition to obtain as much education as possible.